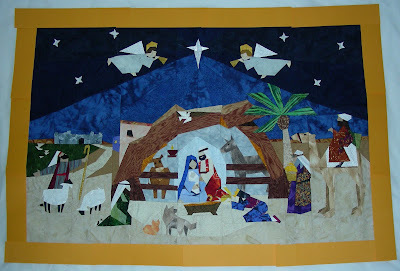 Lisa T's World: Group Nativity Scenes are here!!!! Group Nativity Scenes are here!!!! Betty D. presents her top with a gold frame sewen around it. Really sets off the tiny bits of gold throughout the piece. Very nicely done. Love the dark blue in the upper sky and the lighter blue in the lower sky. Really like the King's robes and the donkey!!!! Betty A. chimes in with a killer sky! The fabrics are incredible but then I am a bit of a batik fan. Really like the fence fabirc and the camel!!!! So pretty!!!! Cody Anne went nuts with her sky! How great. I like the way it frames the manger. And the King's robes are a real winner! Her dove really stands out and the sheep's legs are perfect!!!! Cody Anne is responsible for sucking us all into doing this project. She took our little hands and led us along until it was too late to bail. Always a valuable asset in any good leader. Do lemmings come to mind? Collen has used so many cool batiks! The sky has such movement and the manger is wonderful!!! Like the sand choice and love, love, love the donkey!! Ok, so Miss Priss is a bit behind the deadline but she is coming along nicely. Can't wait to see the piece all together. I love the color choices especially the inside of the manger. Very cool!!! Jan, Jan, Jan, always thinking outside the box. Or is it that she just refuses to follow directions? Doesn't matter 'cause she nailed this one! I love it!!! All in blacks and golds and lots of metallics. Love the pearl palm fronds!! Of course, she had all this stuff in her stash and it solves the question of why she ws buying all those metallic fat quarters in Paducah and Nashville and Houston and . . . . Fairy Frosts will never be the same! Thank you so much for posting pictures of everyone's finished projects! I just ordered their pattern and googled it later and your site came up. It is so helpful to see lots of finished ones to help pick fabrics! and they were all so beautiful!